Doncaster Rovers have completed the takeover of the town's rugby league side for an undisclosed sum. 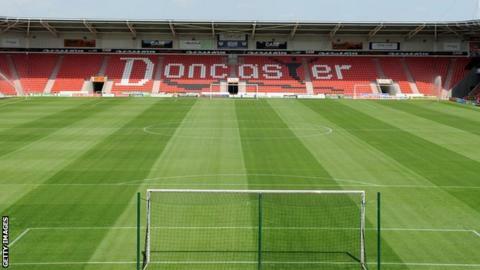 Doncaster RLFC, who play in rugby league's Championship, already share the Keepmoat Stadium. Rovers chief executive Gavin Baldwin told the club website: "This is an exciting day for both clubs and a key milestone for sport in Doncaster. "They are a well run club and are ready for growth and I am confident that we can help them achieve their potential." The Dons finished sixth in the 14-team Championship last season. The clubs will continue to have separate identities, but a statement said it was hoped the deal would lead to a "strategic alliance" between the two sets of supporters. The takeover was also welcomed by the rugby league club's former joint owner Carl Hall, who will continue in his job as general manager. "Doncaster Rovers have a proven track record of delivering best practice off the field in recent years and I know that they will be bringing this first-class level of expertise to the Dons," he said. "I felt that it was the right time for a new approach at the Dons and I know that they will work hard to ensure the club maximises its potential on the field, behind the scenes and within the local community. "I am pleased to be continuing in my role of general manager and I am looking forward to working with the team at Doncaster Rovers to take the Dons to the next level."